Angiogenesis refers to new vessel formation from the pre-existing ones. This process is essential during development, wound healing, as well as the transition of malignant tumors. VEGF family has been identified as a major contributor to angiogenesis, while families of Angiopoietin, PDGF, and FGF govern the process as well. The most important member of VEGF family is VEGF-A, which couples with its receptor VEGFR2 to stimulate signals in endothelial cells for survival, proliferation, adhesion, migration, and tubular formation. 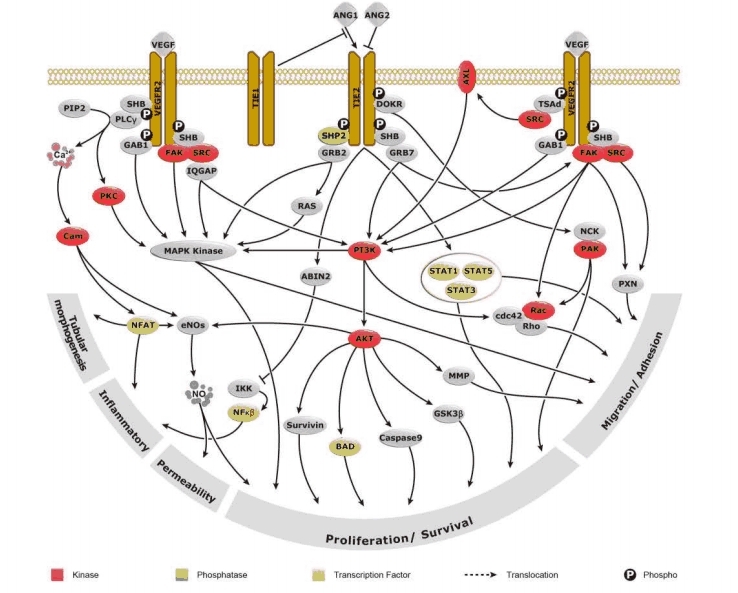 This signaling also mediates vessel permeability and stimulates inflammatory response. Our selection of 100% guaranteed research antibodies related to the VEGF-ANG pathway! We strive to provide you regularly with new and updated pathways to support you in your research. If you are looking for a specific pathway, do not hesitate to contact us!